Throughout this lesson, we have modified the size, power, opacity, etc. of our tools and you have certainly noticed the letters located in a box left of the corresponding numeric value. These are the Connection parameters. The corresponding contextual menu is accessible by clicking on the box. TVP Animation takes all these advantages into account and it is therefore possible to imitate the specific aspects of drawing by hand. * If you connect the Size of the pen tool with the stylus Travel Speed, the thickness of the line drawn will be thicker the faster you move your stylus (to do this, select Speed in the Size connection menu). * If you connect the stylus Pressure to the airbrush tool Power, the more you push down on the tablet with the stylus, the brighter the color will be on the screen. * If you connect the Opacity of the wetbrush tool to the Altitude of the stylus, inclining the stylus will render the aquarelle almost transparent. A wide variety of setting combinations are available. Below we will describe each of them. It is then up to you to make the connections according to your needs and creative spirit, don't hesitate to experiment! * Profile Editor: it will be explained in the next chapter. * Invert: invert the effect of the connection chosen. 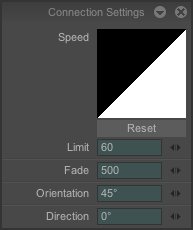 * Speed: the parameter connected to the Speed will change at a speed proportional to the stylus travel speed. * Direction: the parameter connected to the Direction will change according to the direction of the stylus. * Orientation: the parameter connected to the Orientation will change according to the stylus orientation. * Fade: the parameter connected to Fade will decrease its values as the line drawn progresses. * Random: the parameter connected to Random will vary randomly. * Pressure: the parameter connected to Pressure will vary proportionally to the pressure applied to the stylus on the tablet. * Altitude: the parameter connected to Altitude will vary proportionally to the angle formed by the stylus inclination on the tablet. 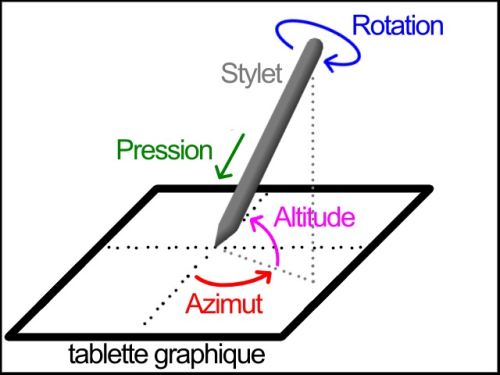 * Azimuth: the parameter connected to Azimuth will vary proportionally to the angle formed between the stylus projection on the tablet and the vertical plane. 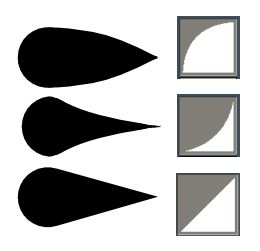 * Finger Wheel: the parameter connected to Finger Wheel will vary according to these options when using the Wacom airbrush finger wheels. Just above, you will find a summary diagram of the connections previously indicated. Note that some tablets do not offer all these options. For optimum results, TVPaint recommends the use of Wacom® tablets ! The speed, fade, orientation and direction connections are adjustable. Orientation angle, direction angle, speed curve and fade speed may be modified in Options in the connections contextual menu shown on the previous page (or select the menu Windows >Settings > Connection Settings). Size connected to Fade for various fade values. Size connected to Direction (left drawing). Size connected to Orientation (right drawing). Size connected to Speed using various curves. All three lines were obtained by increasing the stylus travel speed (i.e. with progressive acceleration). The Text tool with Rotation connected to the stylus Direction.